When Abelard posts a quote from The Letters of Abelard and Heloise online, their mutual affinity for ancient love letters connects When Lily Michaels-Ryan ditches her ADHD meds and lands in detention with Abelard, who has Asperger’s, she’s intrigued—Abelard seems thirty seconds behind, while she feels thirty seconds ahead. It doesn't hurt that he’s brilliant and beautiful. To ask other readers questions about The Love Letters of Abelard and Lily, please sign up. The subject of a surgery for impulse control comes up in this book. Does this surgery actually exist? And, if so, what are the rights of the ADHD community about it? What is a good book similar to this one because this was an increadable book? Thank you HMH Teen for providing an ARC via NetGalley in exchange for an honest review. The Love Letters of Abelard & Lily is such a wonderful debut novel with protagonists that have an ADHD and Asperger Syndrome / Asperger's. Lily Michaels-Ryan and Abelard Mitchell have known each other since they were kids but it wasn't until they're in high school where they got closer. It all started one day, she and Abelard broke the classroom wall and got detention. For Lily, attending school is a da Thank you HMH Teen for providing an ARC via NetGalley in exchange for an honest review. The Love Letters of Abelard & Lily is such a wonderful debut novel with protagonists that have an ADHD and Asperger Syndrome / Asperger's. Lily Michaels-Ryan and Abelard Mitchell have known each other since they were kids but it wasn't until they're in high school where they got closer. It all started one day, she and Abelard broke the classroom wall and got detention. For Lily, attending school is a daily struggle especially having short attention span and being impulsive most of the time. As for Abelard, he's intelligent but has difficulties on interacting with other people. Abelard and Lily's story was light-hearted and cute. Both of them are fascinating characters and the romance between them was pure and heartwarming. After the kiss they shared, they started texting each other and exchanging passages from Héloïse d'Argenteuil's The Letters of Abélard and Héloïse . I love it's their way of expressing each other's feelings. It's clever, endearing and romantic. These two have a lot of precious moments and it definitely made me happy for them. I love Lily's character development. Despite of ADHD, she keeps motivating herself to be better. She's a smart and witty girl who loves classic novels. With the support and love from her family and her boyfriend Abelard, it inspired her more to reach her dreams. It's like "If Abelard can go to college, so am I. Screw the monster inside my head. I can do it!". Kudos to her family (especially her mom) for the patience, understanding and taking care of Lily. Raising a child with a mental illness isn't an easy task. Sometimes Lily have outbursts and yet she remained firm and calm with the situation so as not to aggravate her further. This is a great book for raising a mental health awareness. We should not isolate people suffering mental illness. Like normal people, they have feelings and we should be mindful with our words so as not to hurt them. Through Lily's point of view, you'll get to see what runs in her mind. It's raw and straightforward. It makes the whole book authentic to me and I really like the direction of the story. Lily had a chance to make her own decisions. It gives her a sense of independence and confidence. It's her choice if she's undergoing a medical procedure or not. Everything is up to her. Overall, I enjoyed the story so much. Praises to Laura Creedle's enticing writing style. It may have ended vaguely and a part of me wants Abelard's point of view, it's still a notable and lovely debut. Is it too much if I want a sequel for Lily and Abelard? I want to know what happens next. This was a very interesting, thought provoking, and emotional read. There was much more depth than I expected and I really liked that because it made the story seem more raw and real. In all elements with this novel it seemed similar to a John Green novel. That isn't an insult AT ALL. John Green writes deep, emotional novels with complex characters and that was exactly what this novel also had. Both of the main characters are struggling with their own personal dilemmas while also trying to be th This was a very interesting, thought provoking, and emotional read. There was much more depth than I expected and I really liked that because it made the story seem more raw and real. In all elements with this novel it seemed similar to a John Green novel. That isn't an insult AT ALL. John Green writes deep, emotional novels with complex characters and that was exactly what this novel also had. Both of the main characters are struggling with their own personal dilemmas while also trying to be there for each other. I am being vague here (as always) because I think it's best to go into this story (any story, really) blind. I think there are both characteristics that readers will identify with these main characters as well as characteristics that readers will not relate to at all. Some of the characteristics/struggles that the main characters had I did not personally relate to but effected me emotionally and increased my knowledge towards what people may go through everyday. It definitely made me think. The ending, I am not sure about. Part of me liked it and part of me is unsure. Was it left open for a sequel? Or was it left open so readers could question and interpret their own ending. I also am apprehensive regarding the "solution" that Lily is facing. I do not know how realistic it is in our reality as well as it has me question the message that is being sent. The majority of the novel feels like it's a message that everyone is unique with their own personal assets (in accompaniment with their struggles). However, this "solution" almost promotes the opposite idea and that an individual can be "cured". I am interested to read other opinions on this as well as the opinions of those affected by disabilities. Overall, I did really enjoy this novel. It made me feel and it made me think. The one thing holding me back from fully supporting this novel was the introduction of what I felt was a "solution". That idea kind of makes me uncomfortable with the message that it could be sending. Aside from that, it was a very good read. I had been eagerly waiting for The Love Letters of Abelard and Lily to be released so when my request to review it was accepted, you can imagine how I grateful I was! I was really intrigued by the synopsis since I have read books with autistic reps in the past but never one with an ADHD rep! HOLY FREAKING MOTHER THIS BOOK HAS A HIGH FUNCTIONING AUTISTIC NARRATOR!!!!! I loved this synopsis and was pretty eager to get into this story. Love love loved Lily and Abelard. I loved that they find each other and start the sweetest relationship. I loved being inside Lily’s head, but would have loved to get inside Abelard’s, even for just a peek. Plot wise, it was fantastic. It’s heartbreaking and hopeful and swoony and the way ADHD and Aspergers is portrayed felt authentic. And the use of the letters was unique and created a new path for the both of them through something familiar. My only complaint is that I would have liked just a little bit more at the ending. Overall, it was a quick and compelling read. I could easily read another book about the two of them. A book with a female main character that have ADHD, written by an author that also have ADHD? Love is about being broken beyond repair in the eyes of the world and finding someone who thinks you're just fine. I'm glad that I've found another meaningful contemporary novel that deals with mental health. I honestly didn't have high expectations when I requested this book from the publisher, so I was delightfully surprised by its enlightening and philosophical content. If you're looking for an Own Voices Thank you, HMH Teen, for giving me an eARC of this book in exchange for an honest review. I'm glad that I've found another meaningful contemporary novel that deals with mental health. I honestly didn't have high expectations when I requested this book from the publisher, so I was delightfully surprised by its enlightening and philosophical content. If you're looking for an Own Voices novel that is worth your time (and money), go ahead and pick this up on December. The Love Letters of Abelard and Lily is the story of two "broken" teenagers. Abelard has Asperger syndrome, while Lily has ADHD (like the author). They've known each other since childhood, but they only become real friends when they are both detained for "innocently" destroying school property. Since Abelard finds it extremely difficult to talk face-to-face, he and Lily start a connection through texting. They have both love The Letters of Abélard and Héloïse, and they cleverly exchange passages to express their thoughts and emotions. One of the lessons that I gleaned from this book is that sensitivity and consideration should never be out of fashion, especially towards people with mental conditions. We shouldn't look down on them or treat them with condescension in the academe because they can actually have the capacity to be better or smarter than other "normal" students. For example, Abelard was indeed a social hermit because of Asperger's, but his love for mathematics and science enabled him to participate in regional robotics competitions. Of course, this happened in a work of fiction. Nevertheless, I think that it can happen in real life. Another great thing about this book was that unlike some of its peers in the YA market, it didn't depict love as the cure-all for mental illness. Abelard and Lily were head over heels for each other. They made each other happy and secure, but they still had to struggle with their respective mental conditions. In the end, one of them sought the help of science in order to have a shot at "normalcy." This book was generally enjoyable and insightful, but there was one thing that I really disliked: Lily and Abelard acted like jerks toward their parents. It was good that family dynamics were included or explored. Lily's mom in particular was a prominent figure in the novel as she tried her best to meet Lily's needs. However, I was annoyed that Lily often treated her mother with disrespect. She even had the audacity to say the f word, for crying out loud! Abelard wasn't as bad as Lily, but his behavior around his parents could be described as...cold. I had already encountered the same problem in Eliza and Her Monsters, another mental health novel I recently finished. With that in mind, I really dislike it when such books seem to use mental illness as a convenient excuse for characters to be so rude or ungrateful. All quotes are not final until actual publication. You are a fractured snowflake, a pattern repeated in infinite detail in a world full of salt crystals. You're not broken-you're perfect." PRO: Proper ADHD representation and Asperger's representation. Lily is 30 seconds ahead, neurons firing at lightspeed and Abelard is 30 seconds behind in processing. They are both intelligent and lonely because of the way their brains are wired. It makes them different. Props to the book for not making those differences feel like a bad thing. As someone with ADD, I understood her thought processes so well. The desire to run away. Being unable to stay in the same train of thought. People looking at you like you are crazy because your stories are non-linear but make total sense to you. Sometimes not understanding what people are saying, even though they are talking directly to you because your brain can't process it sometimes. Being medicated and feeling like you are a completely different person. There is so much I identified with, but it was also stressful to read a book with a thought process similar to mine. Hyperfocus. The ADHD superpower. The ability to work obsessively and without regard to the passage of time on something important. NEG: I counted two instances in this book where Lily thinks/talks negatively about other women. It's lazy, it tears down others. SO MUCH NO. Instance #1: "I'm not like other girls." Instance #2: when looking at the other students in the robo-lab with Abelard, she notes two other guys and a "nerd girl." Why are they not nerd boys? Because she is interested in science, it makes her a nerd girl? I'm not a fan. Let's not do this anymore. PRO: ROMANCE. I loved it. I shipped it. I appreciated that they discussed Abelard's sensory overload in regards to their relationship. I appreciated that Lily saw a good opportunity for him and didn't prevent him from reaching out for it. I appreciate that their relationship felt mutually supportive and that they truly understood each other. "I was fine being alone, because I didn't even know I was alone until I met you." NEG: The ending. I can concede that the ending will feel differently for many people, and if I was in (view spoiler)[her (hide spoiler)] position, I might have done the same. However, for a book that is all about being true to yourself and not changing for anyone, it sure made a 180 degree turn. I'm not saying it was a bad ending, but it wasn't the ending I wanted. Thank you to the publishers and those over at Edelweiss+ for sending me an electronic ARC of this book. The Love Letters of Abelard and Lily will be released next Tuesday. Thank you to HMH Books for Young Readers and NetGalley for providing an ARC for review. I think the coolest feature of this story was the authenticity of Abelard and Heloise, the two people Abelard and Lily bonded over. Abelard and Heloise, two star-crossed lovers from the medieval times around 1116, became famous for exchanging love letters - just like Abelard and Lily did in this story, only they exchanged love letters via text. They not only texted each other what they were feeling, they even quoted medieval love letters from Abelard and Heloise themselves. Which brings me to Abelard and Lily's relationship status. I didn't know those two were actually dating until Lily referred to Abelard as her boyfriend. I was honestly surprised and really confused about this turn of events. There were no obvious feelings, no build-up and no indication whatsoever that those two would become an item any time soon. Don't get me wrong, they were really cute together but it was so out of the blue that I thought missed a whole bunch of chapters. Another thing that really confused me were sentences like "Don't come in - you haven't inspreefed ayftey procols" or "I have filled out a Skrellnetch form for you. Your mother will have to sign the kerbling and return it to the main office before you can be burn to claps..." and "Sclur your blashes". For just a moment, I thought those were Spanish words because a few of the teachers and students had Spanish names and were talking in that language too. But I quickly dismissed that thought because even though I can't speak a word Spanish, those couldn't be Spanish after all - even I knew that. In the end, it took me almost the entire book to figure out that Lily's ADHD made her comprehend some words differently at times. At least that's what I think was happening here. If I'm wrong, please explain to me what was really going on. I don't suffer from ADHD, I have no friends that suffer from ADHD and I have never read a book about a character that was suffering from ADHD, which is why I have no clue about any symptons, cause, occurence, or severity of ADHD. Laura Creedle should definitely have explained the basic knowledge of this behavior to the reader. I was bored about halfway through the book and I was skipping through the last 45% of the book and I was rather relieved when it was over. The Love Letters of Abelard and Lily was not the story I was hoping for. The Love Letters of Abelard and Lily is such a beautifully rendered contemporary novel that resonates emotionally and effectively uses well-crafted characters to engage you in a moving story of human connection. We follow two neurodivergent teens, Lily Michaels-Ryan, who has ADHD, and Abelard Mitchell, who has Asperger’s, as they come together after serving detention and bond over a love for ancient love letters. Lily and Abelard grow closer, and they must explore what defines a relationship, and what is best for each of them. I absolutely loved that this story featured two neurodivergent characters. It was fantastic seeing how Lily and Abelard process the world differently. This is Own Voices rep for ADHD and dslyxia, and you can clearly see what Lily is dealing with with her own ADHD - her confusion, frustration, drifting, and focus are all clearly captured and reflected. I loved her talking about how asking for help made her angry, because I feel like that is so easy to relate to. Lily feels like she’s broken, and she breaks things, but Abelard accepts and embraces Lily for who she is. They relate in a beautiful way and their connect and history feel so real and earnest. I really loved them. All of Lily and Abelard’s flirting is so cute and fluffy. I loved all of the texts and references to The Letters of Abelard and Heloise - it was so unique and seemed perfectly them. I also really loved the love letters they wrote to each other - they were made of all things swoon worthy and happiness. The parallels to The Letters of Abelard and Heloise. The passion of wanting more, but not being sure if you can maintain what you have or be who you want to be if you’re with this person, was so beautifully mirrored in Lily and Abelard’s journey. I really love that the characters in the story actively challenge the love cure. Lily’s mom repeatedly tells Lily that she can’t rely on another person, in this case Abelard, for happiness. And Abelard sees Lily, not as a broken person, but a fractal - perfectly chaotic - and worthy of affection as she is. This isn’t a negative so much as a wish, I would have LOVED a POV from Abelard. I was expecting a more even balance between the two characters, but this really was Lily’s story. Abelard having a POV would have been awesome to get more of him, his mindset, his perspective of their relationship, and his emotions. 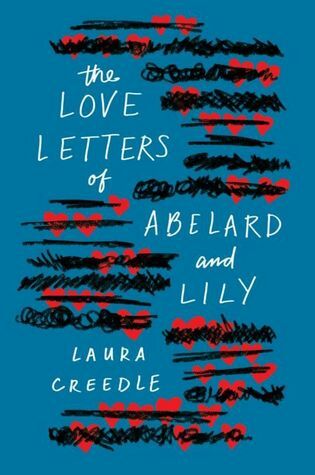 The Love Letters of Abelard and Lily is a surprisingly humorous tale of love and connections between two neurodivergent teens. The characters are captivatingly real and the emotions are grippingly honest. This love story is a tale for the ages. I loved so many things about this book, but mostly I loved Lily. Obviously, the hopeless romantic in me adored that Lily and Abelard found each other. These two people, who were considered "different" connected through the words of two long ago lovers, and from there, love flourished. This one delivered a lot more than I was expecting, and I loved just about every second of it! •Pro: Lily. I LOVED Lily. Being in her head was quite an experience. Her voice was clear and distinct. She had so much t I loved so many things about this book, but mostly I loved Lily. Obviously, the hopeless romantic in me adored that Lily and Abelard found each other. These two people, who were considered "different" connected through the words of two long ago lovers, and from there, love flourished. This one delivered a lot more than I was expecting, and I loved just about every second of it! •Pro: Lily. I LOVED Lily. Being in her head was quite an experience. Her voice was clear and distinct. She had so much to say, and I wanted to listen to it all. Her observations were witty and often insightful. Most times, she made me laugh, but there were many time where my heart broke for her. •Pro: The romance was very different. Lily and Abelard had a very successful texting romance, but it was tricky for them to navigate in person. I found it quite sweet that each was willing to make sacrifices for the other, and I was keeping my fingers crossed that they would make it. •Pro: The texts! Lily and Abelard's exchanges were so sweet and swoony. Whereas they were somewhat awkward in real life, each of them were really able to communicate their feelings effectively when messaging. Also, the Abelard and Heloise quotes were wonderful and used so well. I thought it was fantastic that they could connect this way. •Pro: Because both Lily and Abelard were quite intelligent and well read, there were some really great exchanges on many different topics that piqued my interest. •Con: I know some people like them, but I abhor open ended endings. I need closure, people!! I need definitive answers, and though the ending is hopeful, it is by no means an ending without many questions. •Pro: People keep talking about the "instalove" in this book, but Lily and Abelard actually had a history. Abelard mentions it. Lily mentions it. Even Abelard's mom mentions their past playdates, and apparently, Lily showed a kindness to Abelard which he never forgot. •Pro: I thought the book had some really fabulous auxiliary characters. Rosalind was a wonderful best friend. I enjoyed her and her family tremendously. I also thought Lily's sister was quite special. You could tell how much she loved and cared for Lily. •Pro: For a guy who was not big on socializing, Abelard knew the exact right things to say some times. When he told Lily, "You are a fractured snowflake, a pattern repeated in infinite detail in a world full of salt crystals. You're not broken - you're perfect," it melted my heart. Overall: This book delivered emotions galore! There was laughter, tears, anger, and a lot of grins. This was a solid debut, and I definitely hope to read more of Creedle's work. En weer heeft Gottmer een succesnummer gekozen om uit te geven. Ze geven niet superveel YA uit, maar wat ze uitgeven vind ik over het algemeen echt supergoed. ZO ook dit boek. Ik leefde heel erg met het hoofdpersonage mee. Ze hebben ook iets bijzonders gedaan met hoe de wereld voor haar binnenkomt, waardoor ik me veel beter in haar kon verplaatsen dan als ze dat op de normale manier hadden opgeschreven. Dit vind ik echt bijzonder en knap én fijn! Het plot vind ik gewoon super. Ik heb de hele achtb En weer heeft Gottmer een succesnummer gekozen om uit te geven. Ze geven niet superveel YA uit, maar wat ze uitgeven vind ik over het algemeen echt supergoed. Het plot vind ik gewoon super. Ik heb de hele achtbaan van emoties gehad tijdens het lezen van dit boek, en dat vind ik superfijn en leuk. (view spoiler)[Ook omdat het niet in de standaard manier is dat je naar een einde toe leest waarin het aangaat, maar dat dat al eerder in het boek gebeurt en je ook over hun relatie en de ups en downs leest. Dat vind ik fijn, realistisch, maakt dat het als een compleet verhaal voelt. Het eindigt niet als een happily ever after, het laat zien dat dat niet is waar alle problemen mee opgelost worden en dat vind ik bijzonder en fijn. PS De auteur is zelf ook dyslectisch en ADHD dus ze weet waar ze het over heeft. Maar wederom gaat op wat ik las in Het ongelukproject wat ook breder te trekken is: als je één iemand hebt ontmoet met x (insert: ADHD< autisme, OCD etc. ), dan heb je één iemand ontmoet met X. 1 persoon is niet illustratief voor een hele groep mensen die onder eenzelfde labeltje vallen. Lily Michaels-Ryan thinks of herself as She-Hulk. She's constantly breaking things, acting on impulses, and generally feeling more monster than human, as her ADHD makes her feel like her brain is broken. And being a monster is lonely. But then she starts dating Abelard, who not only understands what it's like to feel broken (since he's on the autism spectrum), but who finds her broken brain to be fascinating and beautiful. And for the first time, she doesn't feel so alone. But just like everythin Lily Michaels-Ryan thinks of herself as She-Hulk. She's constantly breaking things, acting on impulses, and generally feeling more monster than human, as her ADHD makes her feel like her brain is broken. And being a monster is lonely. But then she starts dating Abelard, who not only understands what it's like to feel broken (since he's on the autism spectrum), but who finds her broken brain to be fascinating and beautiful. And for the first time, she doesn't feel so alone. But just like everything else in her life, she knows it's not long before she breaks what she has with Abelard, too. I adored this book. Adored it. Lily is such a mess and so smart and so nerdy and so ridiculous and so endearing and I just love her so much. I spent the entire book wanting to hug her. Through Lily's voice, Laura Creedle captures so perfectly what it's like to feel like your brain is broken that at one point I burst into tears because it all just felt so spot on and so powerful. I was always excited to pick up this book and spend a bit more time with Lily, and I found myself intentionally reading slowly, because I just wanted to stay in this book world with Lily and Abelard and their broken, beautiful brains forever. Dit boek was zo mooi! Lily, impulsively kisses her classmate after going off her ADHD meds. Abelard is high functioning on the Autism Spectrum, doesn't normally like to be touched. The two begin aa atypical romance, despite their challenges, but those challenges may just tear them apart. Laura Creedle's debut novel will have broad appeal to those with and without disabilities. Lily is a frustrating character, especially when med noncompliant and she uses her ADHD as an excuse. At times she doesn't want to ask for the special accommodations, which would be fine if she could function without it. She doesn't communicate about the side effects that cause her to stop taking the meds. I had a hard time seeing what she brought to the friendship with her best friend. I really liked Abelard and how hard he worked to overcome the obstacles of his condition. The most interesting aspect for me was the debate over the brain surgery which would eliminate Lily's need for meds. Was she broken in need of fixing or was she leveling the playing field by correcting an obstacle? I was glad for the choice she ultimately made. The description on Edelweiss originally included information stating that Lily had ADHD and Abelard had Aspergers. I immediately thought I have to read this book. I want to see inside the minds of these characters. Creedle didn't disappoint in her writing. Lily is a fully formed character with ADHD. Readers get to experience all the chaos inside her mind and understand (somewhat) what it is like to live life on the attention defecit spectrum. Then there is Abelard in all of his quirkiness. It is The description on Edelweiss originally included information stating that Lily had ADHD and Abelard had Aspergers. I immediately thought I have to read this book. I want to see inside the minds of these characters. Creedle didn't disappoint in her writing. Lily is a fully formed character with ADHD. Readers get to experience all the chaos inside her mind and understand (somewhat) what it is like to live life on the attention defecit spectrum. Then there is Abelard in all of his quirkiness. It is great fun to read about the inner-thoughts of people rarely seen in books. Now to the plot. Lily is disorganized and a chaotic mess at school. Her parents are divorced and she hopes to go see her father, who lives far away. But she has to turn in all her work, get good grades and stop missing school. Those three things are exceptionally hard for Lily - especially when she doesn't take her medicine consistently. One day she breaks a room divider at school and meets Abelard who is on the other side of the divider. They begin texting each other. Which is really the best way for each of them to communicate. Both Lily and Abelard have to figure out if they want to adapt their patterns and safe routines in order to make room for each other in their lives. I don't know about the depiction of autism, and this is really not a book for people who hate instalove, but it was definitely interesting to read a YA with a female main character who has ADHD. That was my favorite aspect for sure. For me, it wasn't as successful with the romance or the general conceit, but I'm glad I read it for a POV I haven't seen before. This book was everything. I finished it in a day and a half because I couldn't stop reading. The characters are all fully formed and so real and relatable. The insights into ADHD were fantastic. Such a beautiful book. I was lucky enough to read an ARC of this amazing story and I loved it. Lily is so raw and real and her struggles to make sense of her ADHD and her family and her love for Abelard made this book completely engrossing. What to say? All I can say is that I read this book over the course of two days, couldn't put it down and loved every word, every character and every moment that I spent with Lily and Abelard. Whew. I'm exhausted from all the emotions. 'De liefdesbrieven van Abelard & Lily' beschrijft een relatie tussen twee bijzondere pubers, maar wat ik van dit verhaal vond? Dat lees je in mijn recensie! I got to read this book as an ARC, and I must say it was wonderful! Lily is unique, but oh so familiar. There were many times where she would say or think something, and it was the same thing I had heard from my family members who are dyslexic or have ADHD. I felt like I was reading their story, and that meant the world to me. I can't wait to share this book with them. I was surprised, because I thought this was just a love story, but really, this was Lily's story, and how she grows and matures. I got to read this book as an ARC, and I must say it was wonderful! Lily is unique, but oh so familiar. There were many times where she would say or think something, and it was the same thing I had heard from my family members who are dyslexic or have ADHD. I felt like I was reading their story, and that meant the world to me. I can't wait to share this book with them. By the middle, i was kind of done with it. Overall, I enjoyed this book. It was a sweet love story and had good representation of people who aren't necessarily neurotypical. The Love Letters of Abelard and Lily by Laura Creedle follows the story of Lily Michaels-Ryan, a sixteen-year-old girl who suffers from ADHD and dyslexia. During class one day, she breaks a crank on a wall that Abelard Mitchell is on the other side of. Abelard Mitchell is a classmate of Lily's who struggles with autism spectrum disorder. After Lily is forced to apo Overall, I enjoyed this book. It was a sweet love story and had good representation of people who aren't necessarily neurotypical. The Love Letters of Abelard and Lily by Laura Creedle follows the story of Lily Michaels-Ryan, a sixteen-year-old girl who suffers from ADHD and dyslexia. During class one day, she breaks a crank on a wall that Abelard Mitchell is on the other side of. Abelard Mitchell is a classmate of Lily's who struggles with autism spectrum disorder. After Lily is forced to apologize to Abelard, the two of them begin texting and sending each other quotes from The Love Letters of Abelard and Heloise . It is at this point when their love story begins and Lily's life begins to change. I really liked Lily's relationship with Abelard because it felt like they were a good match for each other and that they really understood each other. I felt their relationship was realistic for a couple of highschoolers trying to understand themselves and each other. I felt like there was a lot of back and forth at times and while it was a little hard to keep up a times, I think Creedle intended that. The story is told from Lily's point of view and since Lily struggles with ADHD, she struggles with keeping up and focusing. I really like Creedle's inclusion of points where Lily is not focusing and how life can be for her. I never connected with Lily as a character and, consequently, didn't care all that much about her story. I liked Abelard and almost think I would have preferred the book told from his POV. I think everyone should read this book. It's such a lovely and charming love story about two different children who want to feel love. And it will melt your heart and it will leave you heartbroken,but when you meet Abelard and Lily you will not regret one minute spending with them. Not one minute. Because they will grovel in your heart and stay there forever. I finished an ARC of this in one sitting. Lily and Abelard's story is sweet and unique and made me smile and, okay, made me cry a bit too. Being in Lily's POV pulls you into her challenges and frustrations and you can't help but root for her from chapter 1. Loved it! Such a great story! Lily and Abelard are such endearing characters. I am probably what you would call neurotypical, but I felt that I had a fascinating glimpse into what it must be like to live with severe ADHD and a tiny glimpse into the world of Asperger’s syndrome in our heroine and hero. I loved the construct of texting back and forth using quotes from a pair of real-life Medieval lovers. I would highly recommend this book to anyone, teen or older. Laura Creedle is ADHD, dyslexic and neuro-divergent. She writes young adult novels and blogs at http://adhd-writer.com. She lives in Austin, Texas in an urban forest with her husband and son, a cat who thinks he's a dog, and a tiny dog who acts like a cat. Also, a half dozen raccoons who have burrowed into her attic. Unless she plays NPR on a radio in the attic, because as everyone knows, raccoons Laura Creedle is ADHD, dyslexic and neuro-divergent. She writes young adult novels and blogs at http://adhd-writer.com. She lives in Austin, Texas in an urban forest with her husband and son, a cat who thinks he's a dog, and a tiny dog who acts like a cat. Also, a half dozen raccoons who have burrowed into her attic. Unless she plays NPR on a radio in the attic, because as everyone knows, raccoons hate low key pleasant liberalism. Like most people in Austin, Laura plays guitar. She also owns more than one pair of cowboy boots. Neither of these is a requirement, but they help.